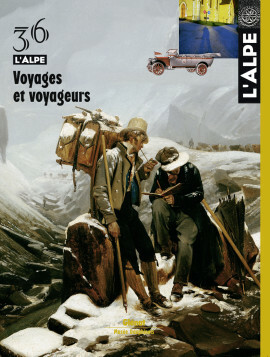 Alpine wanderings, put into writing by untold numbers of voyagers, span a long history. Following the ancient mule trains and inquisitive scientists, solitary travellers and tourists have invented over the centuries and with the passing fashions a true travel culture in the Alps. It could be said that the Alps were discovered at the same time as the Americas. The forerunners in taking off from the beaten trail rapidly formulated the major principles for Alpine travel, in terms of both the goals and the logistics. Johann Jakob Scheuchzer was a link between the Baroque approach and that of the Renaissance at the dawn of the 1700s. The scholarly observer travelled through Switzerland, examining the mountains scientifically and with admiration. Pioneering work that aroused the interest of scientists throughout Europe for Alpine regions. Itinera per Helvetiae alpinas regiones, the tremendous collection of knowledge compiled by Johann Jakob Scheuchzer during his nine journeys through Switzerland in the beginning of the 1700s, was written in Latin and never translated into French. Philippe Mudry took on the monumental task and will publish in 2008 an anthology, as a prelude to the complete edition. Here are two excerpts from the anthology. A turning point in the development of travel, the 1700s were the time when the « sublime horrors » began to interest the European elites. Their scientific and aesthetic fascination led them away from the beaten trails. This quest for knowledge had little to do with the then recent start of tourism, founded on the ancestral fears and the desire to tame the mountains. A period of training in the customs and habits of (higher) society, a long trip through Europe was part and parcel of the education of young aristocrats. In the 1700s, this form of initiation and humanist travel spread to the Alpine regions. The tradition died out a century later, when organised trips took over where the forerunners of tourism had shown the way. Travel stories and guides lie at the heart of incessant actions and reactions in a double perspective. From guides to travel and from travel to new guides, they influence as much as they reflect changes in flows throughout the region. And primarily over the Alpine passes. Is a stroll through the Alps still possible in modern times ? For photographer Raphaël Helle, who generally scrambles through mountain regions the world over in search of news, the answer is clearly yes. In the Chartreuse, his not even secret hideaway, he goes short distances and brings back this charming picture book whose sole purpose is to please him and us. A panoramic trip in comfortable busses became available for people looking for something new as early as 1910. Operated with powerful vehicles, the Route des Alpes, from Lake Geneva to the Mediterranean via numerous mountain passes, opened a new era in itinerant tourism. The crossing by Hannibal has long fascinated and in 1935, Richard Halliburton from the U.S. decided to repeat the feat of the Carthaginian general with his elephants. A festive walk over the Grand-Saint-Bernard pass, memorialised by Valais photographer Raymond Schmid. The mission of our cybergossipmonger for the review is to ferret out the web, an activity that brings to light both useful and less useful things. Here are a few souvenirs of virtual travel covering the Alps and many related fields, via digital libraries and writers famous on the web and elsewhere. Table games and mountains are not the most likely partners. But the voyages and climbs proposed in various forms have provided generations of players with great adventure. This fun way to visit the Alps without leaving one’s living room also reflects the changes in perceptions of the Alps, as shown in the exposition at the Mountain Museum in Torino. A very rare cheese, produced locally and intended for family consumption, ages in natural caves above the small village of Lavaldens (Isère department, France). The blue cheese, made on the farm, will soon disappear with the last people who know how to make it. Dorino Ouvrier sculpts in wood the acts of his mountain ancestors in the Aosta valley. His work centres on movements, a quest to capture daily gestures and existential meaning. A look at the artist and his work.